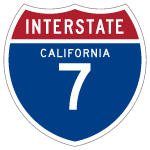 Interstate 7 is a potential designation once considered for the California 99 corridor from the south end of the Central Valley to Stockton. With the publication of the Route 99 Corridor Master Plan, the recommended designation for California 99 was more likely to be Interstate 9. However, several other sources (including Wikipedia, The San Francisco Chronicle, and other media) previously reported that California 99 might become Interstate 7. However, none of these cited an official source confirming that the freeway corridor would be I-7. See the Interstate 9 page for much more information. Page updated August 11, 2005.